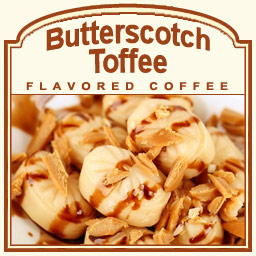 Butterscotch and toffee are two beloved candies, so it's no wonder this delicious Butterscotch Toffee Cream flavored coffee creation hits the spot with its thickened, creamy richness. Sweet and buttery, this flavored coffee features undertones of brown sugar, chocolate, roasted almonds � all complementing each other to create this candy coated coffee. With only 2 calories, this 100% authentic Arabica bean creation is perfect to indulge in whenever you want a sweet and savory cup of Butterscotch Toffee Cream. Roasted and shipped on the same day, the Butterscotch Toffee Cream flavored coffee will be packaged in a heat-sealed valve bag. With the highest quality beans and freshness ensured in every bag, this Butterscotch Toffee Cream coffee will certainly pamper your sweet-tooth and leave you satisfied with every sip.